I was on the phone with mom this morning and she was busy baking a Fruit Cake for her cake class the next day. Due to the constant power cuts in the summer, she has a hard time getting all the cakes baked during class in the morning. So she bakes them once the power is back later in the evening and then lets her students take the cakes home when they come in for class next day. All the talk about cakes and particularly fruit cake really had me craving for some. I took the recipe from her right away and baked a Fruit Cake. 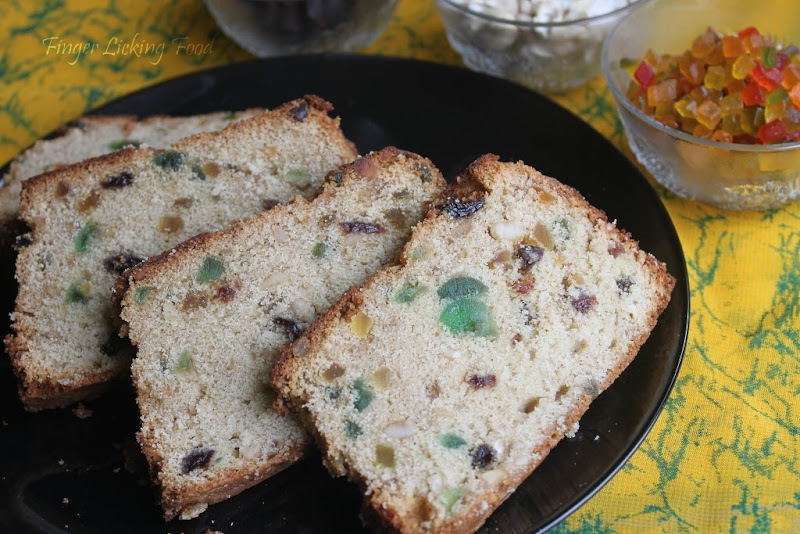 I have made a Fruit Cake before, but that is a dense richer version. 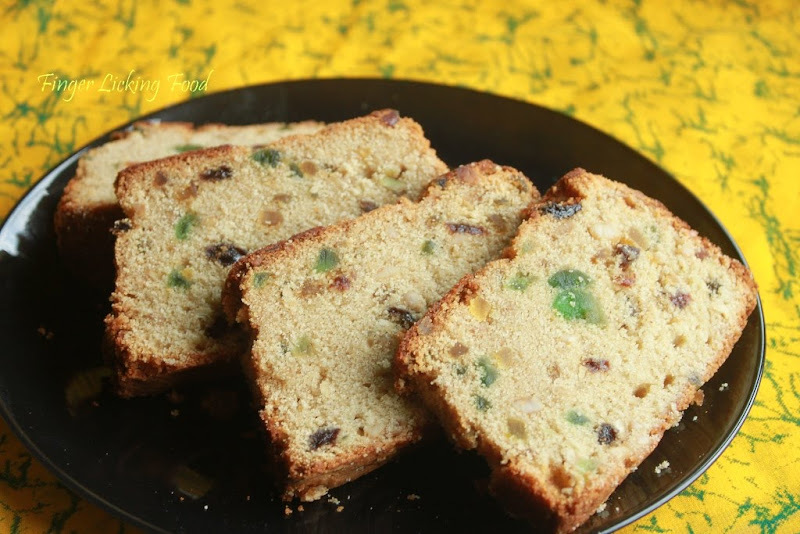 Mom’s Fruit cake is much lighter and just as tasty. Preheat oven to 300F. Grease and flour a loaf pan. Combine tutti frutti, orange zest, chopped cashews and cherries in a medium bowl. Add the spices and rum. Mix well and let soak overnight. Cream the butter and sugar for 3 minutes on medium speed until smooth. In a separate bowl beat the eggs, with the vanilla extract until eggs are frothy. Add this to the creamed butter and combine. Combine instant coffee in the warm milk and set aside. Sieve flour with baking powder. Add soaked fruits to the flour to coat well. This is to prevent the fruits and nuts from sinking to the bottom while baking. Now add this mixture to the wet ingredients. Slowly add the coffee and mix until combined. Pour into prepared pan and bake for 60-90 minutes until a skewer inserted in the centre comes out clean. Let cool in pan for 15 minutes before turning out onto a cooling rack. Cool completely before storing in an airtight container. 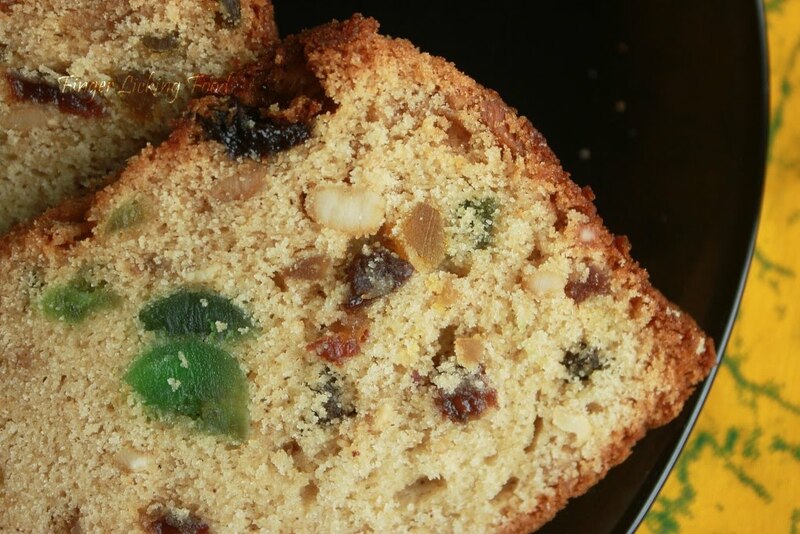 Traditionally Fruit cakes are soaked in additional rum or brandy to enhance the richness of the cake. You can do the same or just go ahead and eat a slice the way it is. Recipe to oven to the table-- all in a day's work! :) Ahh, the bliss of baking. Have a great weekend everybody! 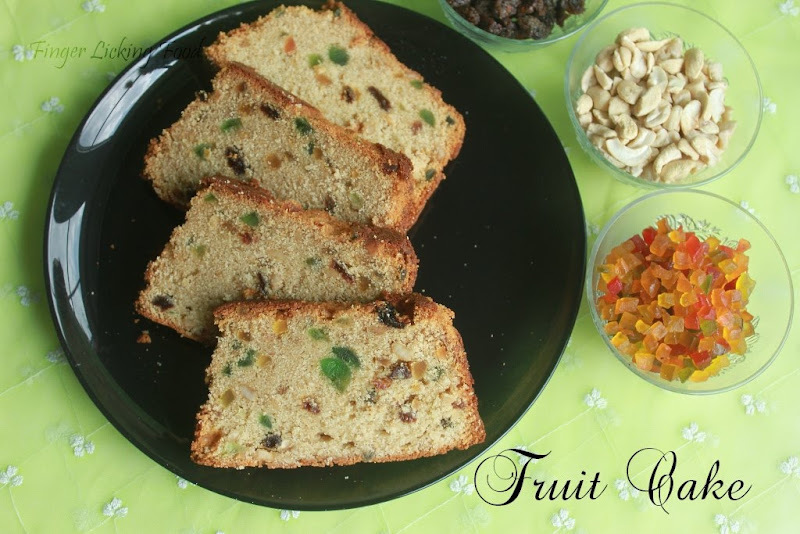 Gorgeous and scrumptious fruit cake..
Luv tuti fruity...this cake is sure yum....looks too gud! Woww !!! this looks sooo delectable. Looking sooo perfect. I love fruit cakes but I've never get it sooo perfect like this. Beautiful clicks by the way. lovely and tempting fruit cake my favourite. Mili, you can get it at the Indian grocers. wow !! I was craving for this cake from the past few weeks... thank you so much for the recipe Namratha !! would fresh cherries work instead? Aruna, apologies for the really late response to your question, I somehow seemed to have missed it! I found tutti frutti at our local Indian grocers, depending on where you live it may or may not be available. I do hope you get hold of it though, its perfect for fruit cake. 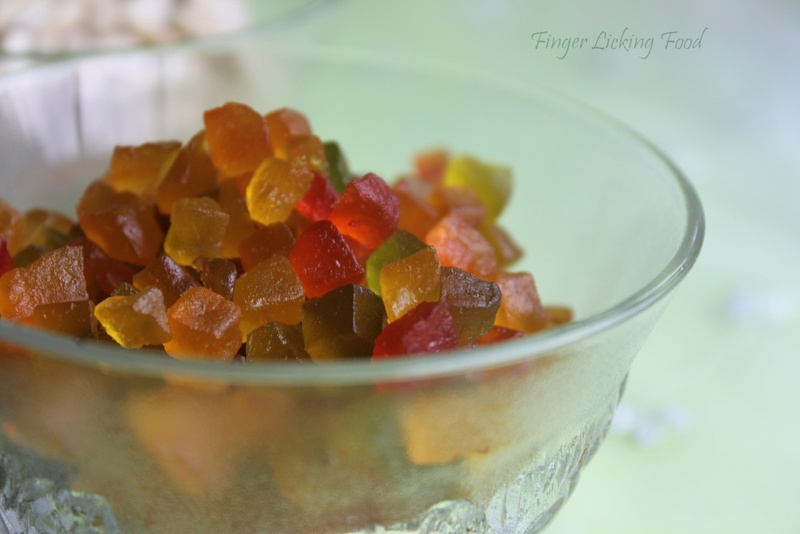 Srilekha, try your local Indian grocers, it is packaged and sold as tutti frutti.